Nolco-Soft is a composite made of polyethylene foam and crepe paper. As a particularly lightweight, tear-resistant, flexible, and cushioning packaging material, it is ideal for protecting very diverse packaged goods and surfaces. 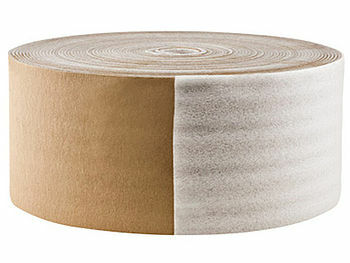 Nolco-Soft is available in rolls of 50 m in length and widths from 100 to 1,500 mm. Once wrapped around the goods to be packaged, Nolco-Soft adapts to a formfitting, protective padding and can be easily fastened or sealed with tape, strapping or stretch film due to its light weight. Nolco-Soft can replace costly outer packaging.